Week 5- Get Mooovin To Healthier Bones! This week we taught the children about the dairy group of the Food Pyramid. They were surprised to know that you can get your daily vitamin D requirement by going out into the sunshine for as little as 15 minutes a day. Yes! It is that easy. Vitamin D helps your body absorb calcium which you get mainly from dairy products and some vegetables like broccoli. We also taught them about limiting soda intake, so that they don’t exceed their daily sugar and calorie recommendations. They were excited when learning about bones and how calcium helps to build strong bones and teeth. This week’s recipe was “stovetop macaroni and cheese” and the kids could not believe how easy it was to make homemade macaroni and cheese. So anyone can do it! They really love milk which is GREAT! So this week we set a goal for them to drink or eat some dairy product at each meal to achieve small steps to a healthier diet. Week 6 - Celebrate Good Times! This was our last OFL class and we definitely went out with a BANG! The kids learned so much and did a super job playing Nutrition Jeopardy. They loved winning door prizes such as spatulas and cutting boards, which they can take them home and show their families what they learned. 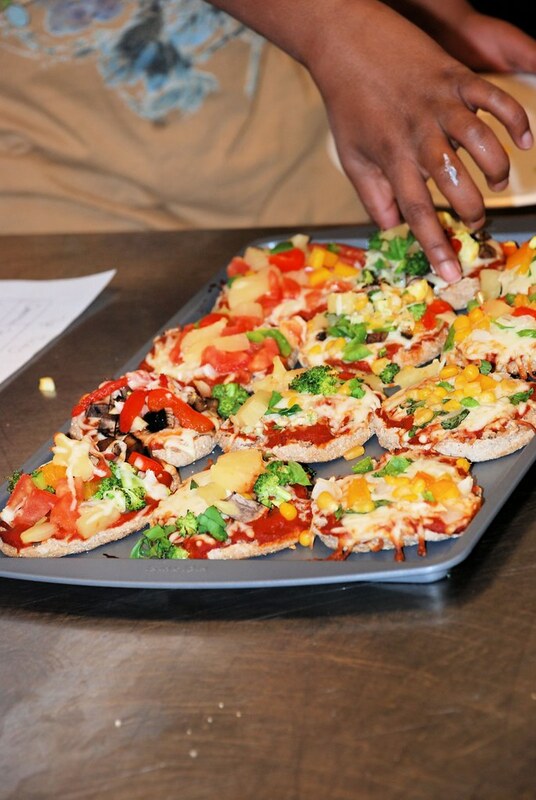 We made individual English muffin pizzas with yummy toppings such as mushrooms, peppers, cheese and pineapple. They really enjoyed getting to make their own individual pizzas to eat. We enjoyed a dessert of fresh bananas and apples and celebrated their graduation from OFL Cooking Class. They all received a diploma and we took a group picture to remember our great group of kids at Neighbor to Neighbor. We are so proud of our class and had a wonderful experience that none of us will forget. Keep up to date with the Food Shuttle! "Give a man a fish. Teach a man to fish. Stock the pond for all."